How to Arrange Silk Flowers Like a Pro – Prairie Gardens Prairie Gardens Design Experts and video tutorials. So. Many. Flowers. Feeling overwhelmed? Learn how to arrange silk flowers like a pro with tips from Prairie Gardens Design Experts and video tutorials. Picking the right container will get your design off to the right foot and is a good place to start since it will influence the overall size of your arrangement. As a general rule, the overall height of your arrangement should be about 1.5 times the height of your container. So a container that is 12” tall would mean your arrangement should be about 18” tall for a total over height of 30. When picking silk stems, mix and match flowers of different shapes, sizes and textures. Start with your biggest blooms, which will be your focal blooms. And then look for accent flowers that are different in shape and smaller in size to complement them. Don’t underestimate the power of greenery stems. They’re important to any arrangement. They help to break up all the different flowers and blooms, so you can focus on all the individual beauty as well as the whole arrangement. Know you’ll often have to cut your stems. We like to cut our stems at various heights, so when placed in the container, every stem is not on the same level. If your nervous about cutting your stems, you can just bend the bottom of your stems to make them shorter while arranging. Once you find an arrangement you like, you can do the cutting last. 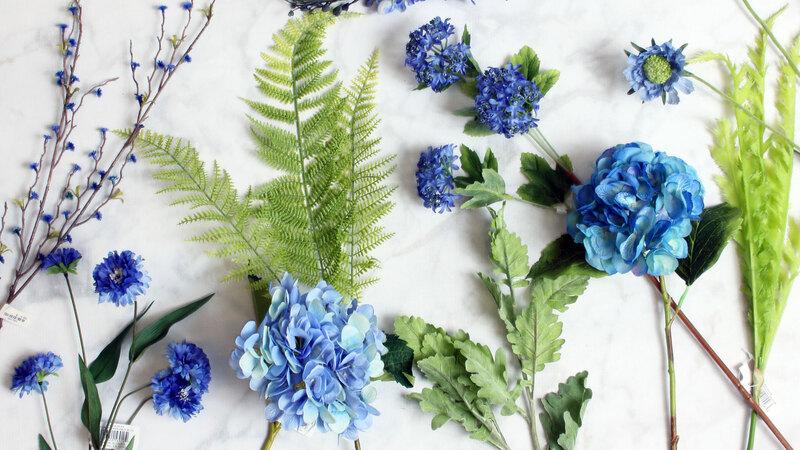 WATCH SOME OF OUR FAVORITE VIDEOS BELOW FOR EVEN MORE SILK FLOWER ARRANGING TIPS. VISIT OUR FLORAL DEPARTMENT FOR AN INCREDIBLE SELECTION OF SILK STEMS, BUSHES, GARLANDS AND MORE. WITH FLORAL EXPERTS ALWAYS ON HAND TO HELP.